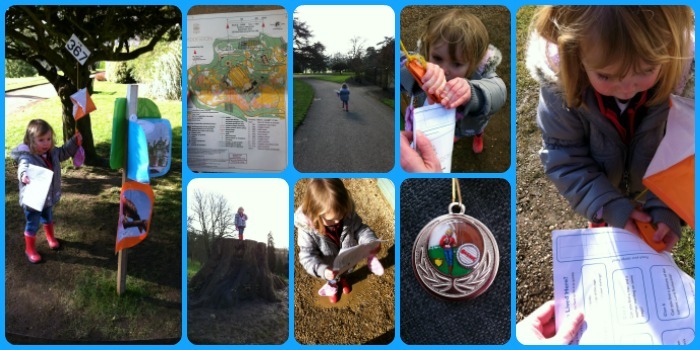 Today Little Miss A earned a fantastic medal for Orienteering! 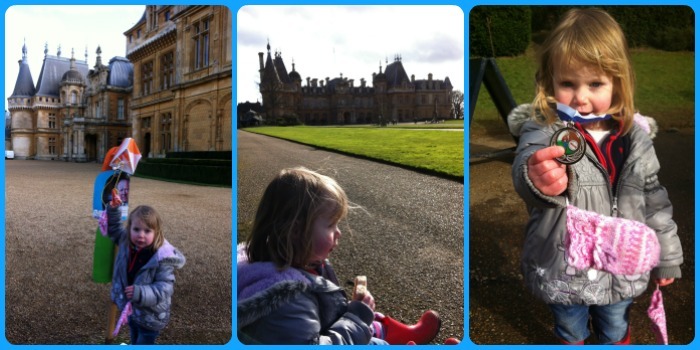 As the sun was shining, I decided to take Little Miss A to Waddesdon Manor to take advantage of the Orienteering Challenge that is running this half term. We got off the courtesy bus at the North Fountain and headed to the tent to pick up our Challenge Sheet and a map. The activity costs £2 per child. There are three routes to choose from. I had the pushchair with us but was told that all the routes were suitable for buggies. I opted for the shortest one as I thought this would be best for Little Miss A. There were 10 markers to find along the orienteering course we were doing - 'Who Lived Here' - which had images of Waddesdon in it's heyday. The route took us past the Aviary and around the back of the house. Little Miss A was good at spotting each of the markers and enjoyed doing the punch marks with the stamps. When we'd nearly completed our course, we had a quick stop on a bench to enjoy our sandwiches in-front of the house. Then we got our last stamp and Little Miss A was rewarded with a fab medal which she was really chuffed with! We spent a bit of time in the Woodland Playground before heading home after what was a great few hours at Waddesdon. It was a brilliant outdoor adventure. Thankyou to the Thames Valley Orienteering Club for organising this fantastic activity. Wasn't sure whether LO would be too young but she really enjoyed it! I love the sound of this and the little medals at the end for completing all the check points. Waddesdon is such a beautiful place to walk around anyway but adding the orienteering challenge certainly makes it more exciting for little ones. Well done on completing the challenge, I was looking forward to this post. Thank you for sharing with me on #CountryKids. Thanks and thanks for hosting #CountryKids. We're frequent visitors to Waddesdon as it's just up the road from us, but this was a fun, different activity to do around the grounds! I was so tempted to do this too this week but I thought it was in organised groups and wasn't convinced that would have worked with Monkey. Sounds like you all had a good time. Hopefully they will do it again Mary as would definitely recommend it! Thanks Mike. That's great to know. I really wasn't sure if Little Miss A would be too young but she loved spotting the posts and doing the stamping. Thanks to the TVOC team who organised this fab activity. Thanks Louise. It was a really fun activity. Orienteering is definitely something we'll try again.